An old commoner has lost something... but what exactly? Which ingredient is the "Gummidge"? Albecius Coloni can be found wandering around central Firewatch in some agitation. If engaged in conversation, all he will say is "Have you seen my gummidge?" Pressing him for more information doesn't work. He wonders out loud how long you have been in Morrowind and insists everybody knows what gummidge is. Unfortunately, although most people say they know what gummidge is, few can agree on one item. Some people will say that they have heard that word used for hackle-lo leaf but say not to quote them on that. Others will tell you that it's probably sload soap and that Albecius could certainly use some. Still others will say that it sounds like scrib jelly, because it's so gummy while a fourth group recall their grandfathers talking about gummidge and meaning wickwheat. Albecius only wants one piece of gummidge. Some of the possible ingredients are fairly easy to obtain. Hackle-lo can be found just outside the north gate of the city. Wickwheat plants grow a short way further down the path. 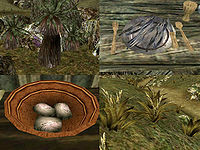 Four portions of sload soap can be found in the bathhouse of The Queen's Cutlass in town, but taking them counts as theft. Another portion is in the Palace Barracks under a bed, and one is held by Gindaman. Three portions of scrib jelly are on plates in Beleth's Bakery and another is on a table in the second floor of Firewatch Library. All these count as theft. Albecius doesn't want all four ingredients, of course - he just wants his gummidge. If you talk to him with at least one portion of hackle-lo leaf, it turns out that it is the gummidge he wants, although why he couldn't step 10 feet outside the city gate to find some is not clear. His gratitude for finding his missing gummidge is non-existent. If you talk to him about it again, he will just tell you to "Get your own!" 10 Albecius Coloni has asked me to find him some "gummidge." When I asked what gummidge was, he looked at me like I was crazy. I guess I should ask someone else. 20 Someone in Firewatch told me that gummidge might be hackle-lo leaf. 30 Someone in Firewatch told me that gummidge might be sload soap. 40 Someone in Firewatch told me that gummidge might be scrib jelly. 50 Someone in Firewatch told me that gummidge might be wickwheat. 100 Finishes quest I brought Albecius Coloni some "gummidge." Apparently gummidge is hackle-lo leaf. This page was last modified on 6 March 2019, at 07:50.